Aberdeen is Scotland's third most populous city and one of Scotland's 32 local government council areas. It has an official population estimate of 210,400. Nicknames include the Granite City, the Grey City and the Silver City with the Golden Sands. During the mid-18th to mid-20th centuries, Aberdeen's buildings incorporated locally quarried grey granite, whose mica deposits sparkle like silver. The city has a long, sandy coastline. Since the discovery of North Sea oil in the 1970s, other nicknames have been the Oil Capital of Europe or the Energy Capital of Europe. In 1319, Aberdeen received Royal Burgh status from Robert the Bruce, transforming the city economically. 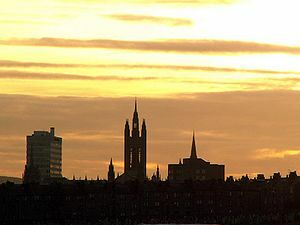 The city's two universities, the University of Aberdeen, founded in 1495, and the Robert Gordon University, which was awarded university status in 1992, make Aberdeen the educational centre of the north-east. The traditional industries of fishing, paper-making, shipbuilding, and textiles have been overtaken by the oil industry and Aberdeen's seaport. Aberdeen Heliport is one of the busiest commercial heliports in the world and the seaport is the largest in the north-east of Scotland. 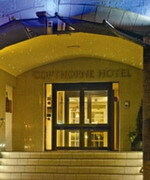 The Copthorne Hotel Aberdeen - Aberdeen’s premier 4* hotel - is located in the quiet West End of the city centre, within easy walking distance of the city's sights, shops and nightlife. Behind the granite facade of this historic building you will find traditional charm combined with modern amenities and impeccable service. The tranquillity of the North East countryside and an array of the finest whisky distilleries and castles are just some of the superb local attractions. Check out the attractions page to see what Aberdeen has to offer - whether you are travelling for business or pleasure, a warm welcome awaits you at Copthorne Aberdeen. 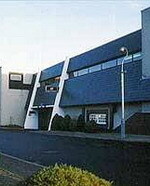 The Britannia Hotel in Aberdeen is located two miles from Aberdeen Airport. Located four miles from Aberdeen city center, this hotel is an ideal destination for the business and leisure traveler. Only a mile from the Auchmill Golf Course, this hotel is four miles from the Maritime Museum. Other area attractions convenient to the hotel include Castle Trail and Whisky Trail. Enjoy fine surroundings and competitive rates at this property, where guests are treated like royalty. At the end of the day in Aberdeen, retire to a large, spacious guest room. The accommodations at the Britannia are richly appointed and thoughtfully equipped for your comfort and convenience. Each room has en-suite facilities such as coffee maker, bath and shower, satellite TV and a stocked mini-bar. At Britannia Hotel, Aberdeen, the well-trained staff will graciously meet all your needs to make sure your stay is as comfortable as it is enjoyable. The hotel is minutes to dining, shopping and entertainment venues. 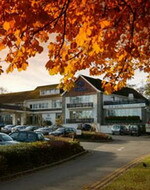 Hilton Aberdeen Treetops is a modern low-rise hotel set in gardens three miles from the city centre, and four from the Storybook Glen children's theme park. The Bar Bacoa Cafe Bar is an informal bar-restaurant serving food throughout the day. The menu offers hot and cold dishes using local produce, as well as wines, cocktails and classic malt whiskies which are available from the bar. Guests can work in the LivingWell Leisure Club's cardiovascular gymnasium with free weights, or relax in the swimming pool, sauna and steam rooms. Guests can practise their serves on the two full-size tennis courts at the rear of the hotel; equipment is available from the Leisure Club. There is a playground for children and a pool table on site. Nearby attractions include the Gordon Highlanders Museum, one mile away, and a dry ski centre, three miles away. The old market area of Mercat Cross can also be found three miles from the hotel. Aberdeen Airport (ABZ) is six miles away, around 20 minutes by car. Jurys Inn Aberdeen hotel is ideally located in the heart of Aberdeen, situated on Guild Street between the Rail and Bus stations and just a couple of minutes walk from Aberdeen Harbour and the Ferry Terminals. Union Street, “The Granite Mile” is just a few short steps away with all the bustling shopping, entertainment and nightlife that Aberdeen has to offer. Jurys Inn hotel in Aberdeen is the perfect choice whether you are visiting Aberdeen for business or leisure and offers great value in comparison to other hotels in Aberdeen. 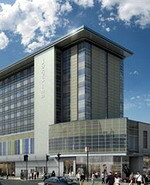 Like all Jurys Inn hotels, Aberdeen offers great value in a perfect location. 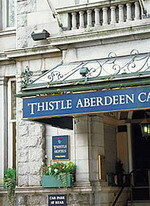 The turn-of-the-century building, Thistle Aberdeen Caledonian, is located in Aberdeen city center. Overlooking Union Terrace Gardens, the hotel is set 400 meters from the train station. After breakfast the concierge and staff at front desk are on hand to help guests explore all that the area has to offer. Business guests can make use of the four meeting rooms, the largest of which seats 30 theater style. The Cafe Bar Caley offers drinks, snacks and meals throughout the day, and in the evening guests can dine alfresco at the Terrace Restaurant, enjoying international and traditional Scottish cuisine. Located in Aberdeen city center, the hotel is within easy walking distance of many attractions; guests can visit the art gallery, 200 meters away; see the Maritime Museum, 800 meters away; or play a round of golf, one mile away. The hotel also has excellent transport links, located 400 meters from the train station, 1 mile from the car ferry, and 7 miles from Aberdeen Airport.